Gone are days when a summer spent in a drum corps meant a summer cut off from the outside world. Gone are days when corps members spent the off-season without frequent communication. Gone are days when alumni lost contact. Why? Facebook! In the age of a social media explosion, corps from the Cavaliers to the Audubon Bon Bons are utilizing the wildly popular social networking site to stay connected to members, fans, parents, and the general public. The Current During the annual Drum Corps International Summer Tour, Chris Lugo, online community manager for the Cavaliers, posts quick messages about rehearsals, off days, and scores to both Facebook and Twitter throughout the day to keep the corps' more than 29,000 fans informed. Lugo also takes time to respond to fan posts as often as possible; he says, "The personal attention I help give, even though our community is big, creates a strong sense of belonging." This is especially helpful for parents whose child is far from home for more than 80 days during the summer. During the off-season, the Cavaliers used Facebook to post video teasers about their 2010 production, and social media has helped them gain support when they needed it most. The corps earned a $25,000 grant this past winter through the Chase Community Giving Program by proving the value of an online community. And when their mobile food kitchen caught fire earlier this season, social media helped spread the word to supporters, which gave the corps the help it needed to take care of its members. The Classics The Star of Indiana Alumni group has been spending the past few months actively preparing to perform during Drum Corps International's World Class Semifinals on August 13. The Star of Indiana members have used Facebook for everything from rehearsal reminders and sharing audio/video, to doling out encouragement and mindless banter. Bobby Hullett, Star of Indiana alum and Facebook group administrator, says he used the site to find "lost" friends and "family" so they could be part of the group. Everyone is excited about performing, and Hullett said, "It's as if we've stepped into a time machine. Of course, we're all older now and most of us have families of our own, but when we're together as the Star of Indiana, that's our family too." Other alumni groups are also using Facebook to stay in touch. The Audubon (N.J.) Bon Bons (a former all-female corps) recently organized mini-reunions in Wildwood, N.J. during the annual Wildwood Elks Parade. Carol Pennisi Terreri, co-director of the corps' alumni association, said that before Facebook, alums didn't stay in contact unless they participated in the organization's Alumni Chorus. Their mini-reunion weekends in Wildwood have grown from five people in 2008, to 11 people in 2009, and to 23 alumni members and four instructors in 2010. One alum even flew all the way in from California to attend! The Bon Bons also share pictures of their marching days to keep the memories alive. One that quickly became a favorite in the group shows two Bon Bons — Pat Cattell Quackenbush and Mona Russell DiComo — with their Blue Rock Drum and Bugle Corps beaus, Tom Quackenbush and Clayton "Skeeter" Varner. The original picture was taken in 1970 at the VFW Nationals competition in Miami and during the 2010 reunion, the four posed again for the camera. This spring, former DCI member corps 27th Lancers used Facebook to preserve the memories of corps founder George Bonfiglio. After he passed away, alums communicated through their Facebook group to orchestrate a brass performance at his funeral. Stephanie Louden, creator of the online group said, "Facebook provided an outlet for communication through chat and posting stories, videos, and pictures of our times together, and has brought our 'family' back together again." Through this group, members have been able to reconnect, plan reunions, share stories, and console each other. The Newcomers Facebook isn't something only World Class corps are taking advantage of, as seen by the online presence of DCI's four newest Open Class corps — Fort?©, Genesis, Platinum, and City Sound. All four corps have an active fan base, and the corps are uploading photos and videos to keep parents and friends informed on what the members are doing while they're away from home. Genesis uses its page to keep fans up-to-date on daily schedules, and Fort?© is using its page to remind fans and supporters of fundraisers. Corps also see the potential for membership recruitment, and are posting information on auditions and open positions within the corps. The Source As a central clearing house for all things marching music, Drum Corps International is at the crest of the technology wave with its own Facebook fan page, Twitter account, and a brand-new DCI App for the iPhone. 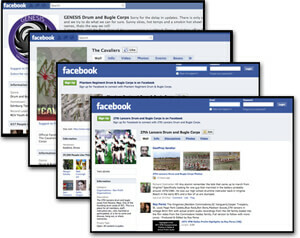 Drum Corps International's John DeNovi said, "For fans, the DCI Facebook page is a place they can get relevant information and news they may not necessarily see on DCI.org. We run special Facebook exclusive contests like ticket giveaways, and it's also a place where DCI fans can meet others and feel like there's a community geared just for them." And that community continues to grow exponentially. With more than 75,000 users currently engaged in the DCI Facebook page (more than 4,000 fans were added just last week! ), new drum corps fans are born every day, and old ones are reconnected. Become a fan of Drum Corps International on Facebook. Check out the @DCI_Tour Twitter feed. Download the DCI iPhone App.